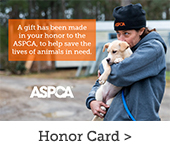 Celebrate the life of a beloved person or pet with a Memorial gift to the ASPCA. Donations made in remembrance honor your loved one's memory by helping ensure a better life for animals and giving hope to those still in need. 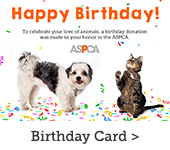 You can choose to send the recipient the card design above by email or postal mail.